Perfect for your take-out restaurant, cookout, party, gathering, or other catering event, this Visions black heavy weight plastic knife will exceed your serving needs! Complete your plastic cutlery setting, or use it to fill your flatware bins at your snack shack or concession stand. Made of durable polystyrene, this virtually shatterproof, disposable knife is strong enough to last through your meal service, and can be easily disposed of, making cleanup a breeze. Solid, well made, economical; recently ordered as part of a set for our son's wedding rehearsal dinner. Pleased with packaging, price, and service as always. If you want quality you must get these heavy plastic knife, we use them for heavy dinners and our clients loves how strong they are. Used the Visions Black Heavy Weight Plastic Knife to slice a hashbrown egg quiche. Instead of using a real knife, this plastic knife did the job very easily. Strong and sturdy knives, even cut our steak, using the plastic fork, perfect!, No complaints here, great cutlery for the price. Will buy all my products of this from Webstaurant only, no need to go anywhere else. Very strong material and very durable. This knifes are exactly what we're looking for our events. Nice design. Price very affordable and delivery time super fast. Good price, like that they are black. Feel strong and bend a little but not so much that they feel flimsy. I will order again. I purchased these, the forks, and spoons. I expected the quality to be inferior to the Dixie brand I used to get, but they are fantastic. Truly heavyweight. At almost half the price these are amazing. These knives are not too bad. The quality is OK, not as sharp as other knives I got at other places. Other than that, the price and amount is good for what you get. These are good if you have optional takeout, but if you are a restaurant that does a lot of togo, I would suggest a product that comes with both a fork, a knife, a spoon and a napkin. Pricing these out, it doesn't seem to be in the best benefit of the business to buy them separately, and because they come in a large box, they are susceptible to spillage and debris. Thank you for the review Jeanne! For an alternative that might better meet your needs, try this Visions Wrapped Black Heavy Weight Plastic Cutlery Pack with Knife, Fork, and Spoon - 500/Case instead! 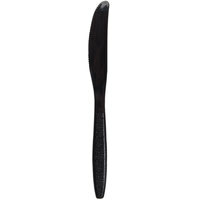 Fantastic Quality for Heavy Weight Plastic Knife It holds up very well while cutting meat and spreading butter and jams because of the sturdy construction and the black color compliments any decor!!!! These black heavy weight plastic knives are very affordable and simple! What a great price for such a large amount. Will be buying from here again. These plastic knives are sturdy and sleek, easily cutting the pastries we sell in our shop. I've never had one break, and they arrive quickly. Good quality disposable knife without breaking the bank. They are heavy duty and work well for us. They are save us tons of money from buying elsewhere! The Visions Black heavy weight plastic knives are a perfect compliment to the Visions Black heavy weight plastic fork! Both are heavy duty and hard to break. These knives are very good for the heavy weight. We use these on a daily basis and have had zero issues with them. They seem to have a very sturdy handle. So if you are serving carrot cakes, brownies or any other pastries need to be cut while eating, you need a heavy weight plastic knife and this is a good solution for it. We love these disposable black knives. They are very sturdy and durable, and do well with hot foods. Our guest like the disposable utensils for use. Nice heavy duty quality knife. I was looking for heavy duty knife with good prices for my restaurant to use for entrees and this was the perfect option. A heavier duty fork. Cuts through chicken and steak (as long as the meat is not a piece of leather). I have use this fork at many different businesses and have never been disappointed. Does not bend easy for a plastic fork. For the fraction of a cost a little higher than less expensive plastic fork, this one is a no brainer. We use these knives for our off site catering events. They are well made and much more durable compared to other similar products that are out there. Really like this knife. It is heavy duty and durable. We like the black color over the standard white color. Cuts through food items really well. These knives are the second best thing to real silverware. They are heavy duty and look classy enough to serve customers with your best dishes. Great addition to the table with the fork and spoon. Made the table look fancy and elegant for the dinner service. will use again for my next event. Super high quality compared to medium weight. Price is so much better than big box stores similar products. I recommend this product for box lunches, comfort food, take outs, pig pickings, cookouts and more. These knives are great! They are sturdy and durable! None of the employees have had a hard time cutting into their food! I also like the black color instead of the traditional white. The delivery was fast and I will be purchasing these again and again! Excellent quality. These knives are very solid and do not bend or snap. They are pretty good at cutting, but it may take a little while to cut through dense meat. Otherwise, excellent product for the price. Some people think that all plastic silverware is the same, but I tell you that these stand out from the rest. Very heavy duty, and exceptionally reliable. These knives are a great alternative to real silverware. The black color is nice instead of a very fake looking silver color, they are great for one time use. Good quality. Sturdy, doesn't break easily. Thin handle. The sleek black color makes it look more formal than white. Great for cutting things on the go! These heavyweight plastic utensils all right nice quality product. They're available in white or black. Nice sturdy plastic holds up to even the toughest foods. Plastic knife as described. I ordered for years and years from our local distributor. I couldn't believe how much i saved and could have saved buy purchasing this product. I didn't want a cheap product and I was glad heavy weight meant heavy weight and didn't seem cheap. Love them. I would recommend. Good thick knives, good for any ocation, we use them at a ice cream shop and costumers love them cuz they don't brack easily! Good quality I will reorder !! If you are looking for a low cost, disposable knife option these are a really good value. We have been rated 4 of 5 stars because they cannot be recycled. It would be so much nicer if they could be. We recommend these for food trucks and other places where to go food is the majority of the business. Visions also makes heavy weight forks and spoons that match these black knives. These visions black heavy weight plastic knives work great! They are really strong and have a rough textured handle. Over priced plastic utensils are a thing of the past if you buy from Webstraunt. We were paying almost twice the amount thru our local distributor for a product of the same quality/. We like this Visions black heavy weight plastic knife. It has substantial weight so it is not at all flimsy. Will not break easily as well. Great quality black, plastic knife that is perfect for putting in your to go bags. We feel great about putting such high quality plastic utensils in our to go bags and our guests love them. These are great! They cut through our thick angus cheeseburgers while still being light and manageable. We're happy with both the quality and the look of this product. Great heavy weight knife, we use all disposable utensils and plates in our restaurant and this is a inexpensive good quality knife. It doesn't break or shatter if put under a lot of force it will just bend a little. This is our new knife from now on. Used at a pig roast birthday party & these held up great to the meats! some had some "scuffing" defects but it did note effect the performance or quality! will buy again! These individual black heavy weight plastic knives are exactly as advertised and what I ordered. They are definitely heavy duty and being individual helps me reduce waste. Perfect heavy weight knife! We have never snapped one in my office, which we have done with other brands. They also look better than cheap plastic cutlery. The strength of these knives is fantastic. For such a low price, these black plastic knives are a great deal. You can slice, cut and spread all with these plastic knives The black pairs well with any color. These knives are far more superior than your standard plastic knife. We have not had a single complaint from customers regarding flimsy or cheap since we switched. This is not good to cut anything hard, I would only use this for butter or bread. The teeth break off pretty easy if you to use it on steak or hard fruit. We appreciate your review, Andre! If you are looking for a different product that would better suit your needs, please contact our Customer Solutions team. very good item and very strong! Visions has done it again with their sturdy and lovely heavy weight plastic cutlery, for this price and this many, no brainer. These knives complimented the forks that was purchased for the party and the cost was within my budget. This is a great product and I would definitely not only buy it again, but would also recommend this product. They come in handy when you need them for events or parties. No dishes at the end. Love these knives because they are just so durable and makes it ten times easier to cut through certain foods when they are not flimsy. Just used these for a banquet and they were great. Perfect weight and attractive. Needed this weight to handle cutting through pasta and spreading butter. My client was very pleased. These knives are great! We use them for take out orders in our restaurant and they are very sturdy non flimsy knives. Perfect to take along with any meal. THESE KNIVES WERE A GREAT ACCESSORIES WITH THE FORKS AND SPOONS. THE KNIVES WERE ABLE TO CUT THROUGH MY ITEMS WITH EASE AND DIDN'T BREAK. Great knife, had no issue cutting the chicken that was served. Did not have one bend or break. Worked for less difficult things to cut with ease. Was great that they were full size as well. Have washed and used some with no issue. Would buy again. These plastic heavyweight knives are very sturdy. We supply them for our customers to spread cream cheese on their bagels and cut treats to share among themselves. We have no complaints about these knives! These plastic knives are sturdy, not flimsy at all. Perfect for my cafe needs. Also great value for the price for the amount you receive. Very durable and solid plastic ware. Definitely, will be repurchasing. I use them in my cafe for light food like salads, buttering and such but they hold up great! We use these knives for all of our catered events and weddings. The black plastic cutlery adds a elegant and practical option that we love. Great, heavy weight disposable flatware, Our customers use this knife to cut bbq brisket and do not have any problems. The cutting edge is surprisingly sharp. We are very pleased with the quality of these knives, very sturdy and strong. They hold up great, so glad we didn't purchase cheap utensils. Better than Choice Black utensils. use for muffins, bagels, etc. No breaking, no discolored items. Great presentation and worth a few extra dollars per case. great alternative to our local supplier. cost about 1/2 compared, even if you factor in shipping. webstraunt always has the best prices in town. Yea! I used these for a wedding. They are great sturdy plastic ware and looked great. I would highly recommend there and will use them myself in the future. These are good solid knives for to-go orders. The thing I love more then anything is the way they pack the case. Other brands the same box would be 5 times the size. We always need more space and to save money. These do both! We use this brand of plasticware all the time. We like ordering the large quantity (1,000) so that we never run out. They always arrive quickly. Very high quality disposable knives. They look and feel great. We also bought forks from the same company and they are also awesome. Highly recommended. I am using these for my daughters wedding. Nice heavyweight quality at an affordable price. These are being placed inside the napkins for easy distribution during the reception. Very nice product. We have had issues in the past with other products where the utensil will break as the customer is eating their meal. We have not had any incidences and I am very pleased with the quality for the price that I pay. I recommend this product. The knives are serated (sp) and very durable. They are a nice large size and give the meal an upscale look. I wrap them in a napkin with the paper wraps on this site. What a quality item. We purchased this item to use for snowbird potlucks. We were very pleased with the quality of this product. What a great price. This sabert knife is good to use as a one time deals or run it through your dishwasher. This can be used for holidays and graduations and get togethers. You should use these anywhere food is served.